1 The general view was that this was an excellent debate, particularly in the first hour when the candidates were allowed to go at each other properly. There was a lot of passion in the room, both on stage and in the audience, and Alistair Darling in particular produced a performance of effervescence and argumentative determination that not many knew he was capable of. Alex Salmond, meanwhile, seemed to want to present himself as more of a cool customer than the hothead he may have come across as at times. It all made for a very interesting contest and felt essentially like a bolt of electricity through the campaign. 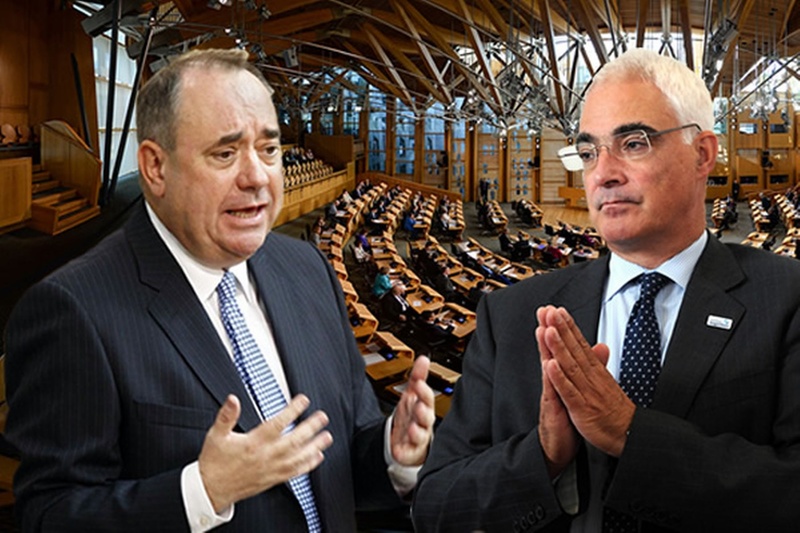 2 Alex Salmond simply refused to engage properly with Darling’s question on what would be ‘plan B’ if Scotland were not allowed to enter a currency union with the UK. Repeating constantly his view that Pound Sterling was ‘Scotland’s currency as much as it is England’s’, Salmond chose, in a portent of how much of his night would go, to use some old quotes, some off the record and some on the record, to suggest that in private the ‘No’ campaign knew there would have to be a currency union. He also claimed that keeping the Pound would be ‘better for Scotland’. Darling, reminded Salmond that the Pound was the UK’s currency, and Scotland wanted to leave the UK. He then challenged his opponent to explain how having a currency that would mean that interest rates would be controlled in London, fiscal policy would be restricted by by borrowing limits imposed by London, and there would be no bank of last resort (which, he pointed out, was big enough to save RBS in 2008 but wouldn’t be so if there was just a Bank of Scotland. The Better Together campaign will probably believe that all they need from now to get over the line is to keep on bringing up the ss sue about currency. 3 Salmond then went for a rather odd strategy of quoting odd lines from newspaper cuttings, many of them off the record, some of theme completely out of context and irrelevant. Andy Burnham’s April Fools joke about Scotland having to drive on the right if they vote “Yes” was presented as an actual threat, as was Philip Hammond’s musings about future threats from outer space. It sounded like Salmond was wasting his time airing Yes campaign grievances instead of actually trying to debate real issues. Then, suddenly, like a long range shot on the counter-attack that trickles into the goal under the keeper, Salmond had Darling on the ropes. His question was whether Darling thought Scotland could be successful as an independent country. Darling had a simple, tap-into-the-net answer; “of course Scotland would be a successful independent country, but it would be better together with the UK.” It was so easy, it contained his campaign’s main slogan, but he missed it, rattling on about risks inherent in independence instead. This was a mistake, and Salmond managed to take advantage of it to sidestep Darling’s reminder of his non-existent ‘legal proof’ that Scotland would be allowed into the EU. He pointed out that the UK may pull out of the EU, pushed by Tory party members, who again Salmond pointed out weren’t voted for by the Scottish, most of whom want to stay in the EU. So Salmond went into the half-time break having pulled into the ascendency in a manner that surprised even those who were watching it. 4 The audience participation was as partizan as you might expect and contained some repeated questions as well as a bit too much personal criticism of Salmond. He engaged well with the audience, coming out from behind his lectern when answering questions, and was strongest when reminding us which policies an independent Scotland would change. We had an attack on austerity, an attack on the bedroom tax, on nuclear weapons and on tuition fees. He reminded us that the UK could and should have developed a sovereign wealth fund with its North Sea Oil revenue (apparently Jim Callaghan wanted to when Prime Minister in 1978, but Margaret Thatcher preferred to use the revenue to fund tax cuts). Darling did point out that if Scotland kept the pound they would still be stuck with most of the policies. Salmond was criticised for his ‘behaviour’ during the debate by an audience member, and I would agree it was rather sad then when he didn’t have a good answer he resorted to personal attack on Darling’s record as Chancellor, which, it is important to note, consisted of trying to clear up the mess made by the lack of regulation of the banks when Gordon Brown was Chancellor. This was unnecessary, and had little to do with whether Scotland should be an independent country. 5 At the end we were reminded how good an unchallenged public speaker Salmond is. He listed the three reasons Scotland should be independent (being governed by people they voted for, creating a more just society, letting people who live and work in Scotland decide what is best for it), and the fact that I just remembered that off the top of my head an hour later shows how clearly he speaks. He wasn’t so good under questioning by Darling, and suffered from high expectations, which meant that Darling came across better comparatively than many would have thought. At the end, a poll said that the 56% of the Scottish public thought Darling had won the debate, and 44% thought Salmond had won. These are significant numbers, as they were the exact numbers that were voting no and yes respectively in a poll released earlier that day. The point being that a Salmond needed to win people over, and I just don’t think he did. P.s. STV promised to broadcast the debate live on their iplayer so those of us in there rest of the UK could watch it. That didn’t work, leaving a lot of people very frustrated. Perhaps they underestimated the level of interest, but they shouldn’t have been, because everyone in the Uk will be affected if Scotland leaves. Thank heaven for the TvCatchUp app, with ITV region set to Glasgow! « GDP being back where it was is not a ‘recovery’. Investment needs to recover too.